< Crab Apple Crumble Recipe! Olive Masterclass with Omar Allibhoy and Olives From Spain! I was recently invited to attend an Olive Masterclass with the talented Spanish chef Omar Allibhoy and hosted by Olives From Spain. There is a widely believed misconception that the majority of olives originate from countries such as Italy and Greece. 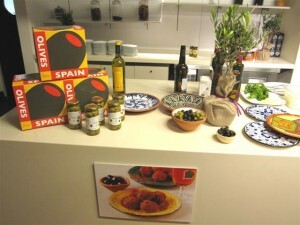 When in actual fact 40% of the olives sold worldwide originate in Spain. Just a quick check of the jars and bottles in your local supermarket should confirm this. 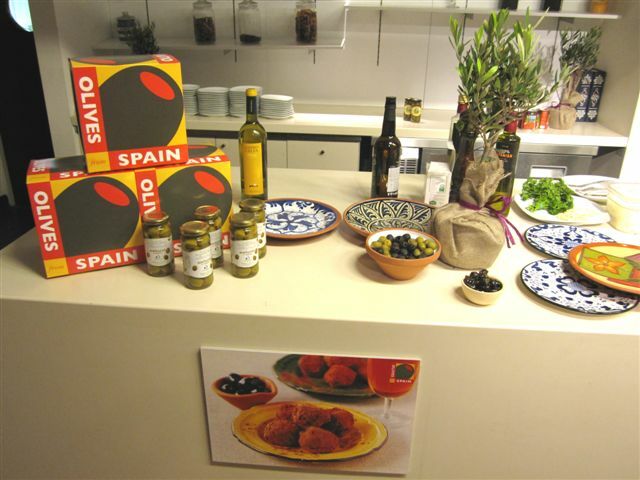 Spain also offers the greatest varieties of olives and the most nutritious. The climate being absolutely perfect for growing fruits of the very best quality. We started the evening by perusing the many varieties that Spain regularly produces. There is a huge selection of sizes, colours and stuffings (I shall no longer think of them as just green or black). Apparently seaweed stuffed olives are very popular in Japan! In between yummy taste testings, we learnt about the amazing health benefits they offer. I must confess that I was rather ignorant on this point, I knew that the oils were beneficial but I had always assumed that olives were too high in salts etc. In fact most of us are actually eating far too few. Leading experts recommend that we all eat at least 7 olives a day! They aid digestion, are high in Vitamins A, C, D, calcium, iron, potassium, magnesium, phosphorus and iodine. Whew, what a list! Incidentally all olives can be made into oil, but not all are good enough to become table olives. They must be easy to pick from the tree, not too tough on the outside and have a good shape both inside and out to make the grade. If you thought these small fruits were just something to throw in a salad or pasta sauce, you’d be wrong. Enjoyed since before the time of Christ, they are an incredibly underused ingredient in this country. The Olives From Spain team including Omar are on a mission to show us just how versatile and enjoyable they can be. 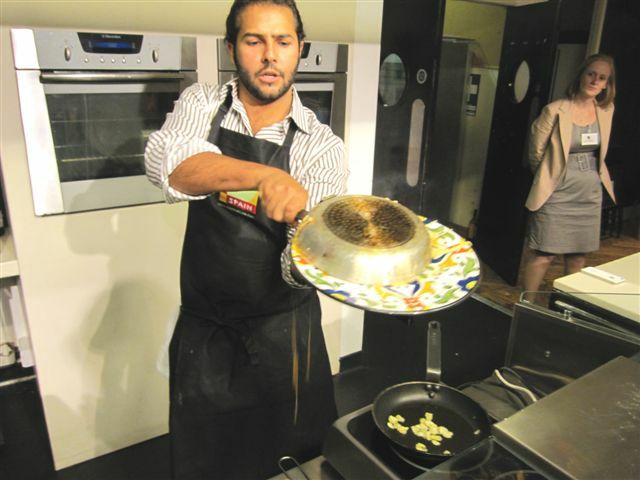 Omar was described by Gordon Ramsey as the ‘Antonio Banderas of cooking’ and has a natural enthusiasm for his art that is quite infectious. He began by cooking a wonderful Tortilla de patatas, aceutunas espanolas y chorizo (Spanish Tortilla with Spainish Olives and chorizo). 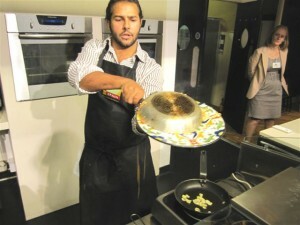 This dish was so wonderful that we’ve already made it several times since meeting Omar. What’s more my children absolutely adore it and I have a feeling it will become a regular addition to our menu (I shall share the recipe with you all soon). We then enjoyed a beautiful Seabass dish, followed by a chicken and to top it off we ate Chocolates made with black olives. You read that correctly, olives can also be used to make sweets! Their saltiness renders the confections similar to a salted caramel. But if the flavour is too strong for you, a good immersion of the olives in water before cooking reduces their saltiness considerably. Spain has retained a very farmer based production and this is perhaps why they haven’t sold themselves as well as other countries in the world of olives. But with events like this one I hope this is an oversight that shall soon be rectified. After congratulating Omar on his exceedingly delicious food, I came away feeling very full, far more informed and truly excited about the future of olives in my house. They are the perfect ingredient for busy families; nutritious, delicious and they last forever. I have also found that with comparatively few cupboard ingredients you can produce a huge variety of dishes to suit every taste, which makes them even more economical. 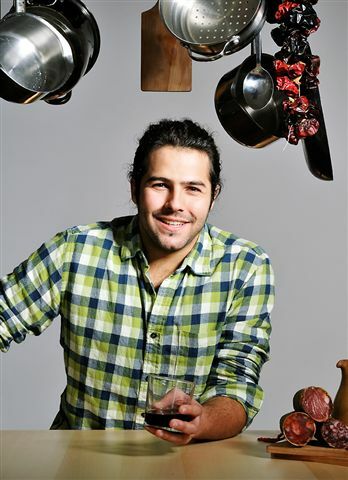 Even more exciting Omar has given me permission to share his wonderful recipes with you all, so keep your eye on the blog in the coming days! 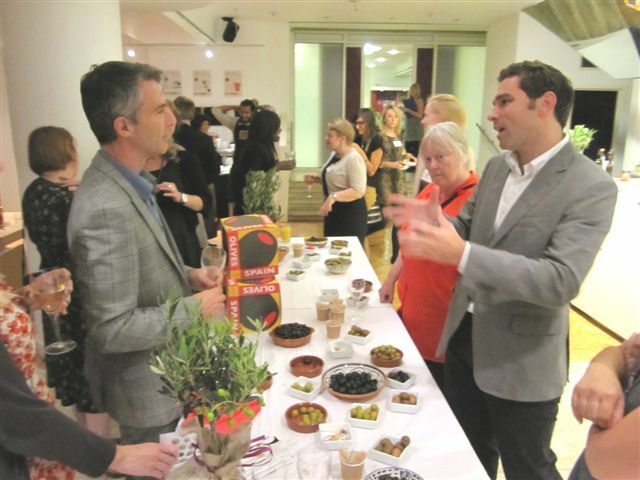 This entry was posted in Out and about, Reviews and tagged event, olive chocolates, olive masterclass, olives, olives from spain, omar allibhoy, seabass, spanish tortilla, tapas. Bookmark the permalink. 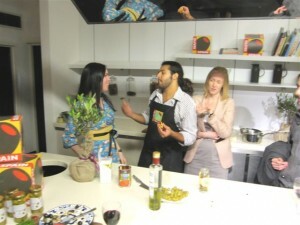 2 Responses to Olive Masterclass with Omar Allibhoy and Olives From Spain! 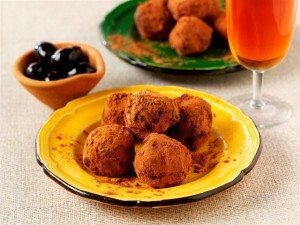 I’ve tried the chocolate olives are they are surprisingly nice!